Poland, being situated next to Germany, makes some excellent beers, particularly dark beers. Despite some excellent beers being produced in Poland, the Poles don't drink alot of beer primarily due to a strong spirit drinking culture. As such the breweries have had to become quite inventive and make beers such as the Super Mocne. So Karpackie Super Mocne is a Euro Strong Lager, basically it is supposed to be a lager with a higher alcohol percentage. Typically however this style is a darker colour than contemporary lagers and often taste sweeter. It is a very enjoyable style of beer and is great to drink in winter due to the warming qualities of the alcohol and the sweeter malt taste. The pour is, as expected, a dark gold/amber colour. A good three finger head billows forth and is a brilliant white colour, however this disipates rather quickly to absolutely nothing. The beer appears to be very flat thereafter as there are almost no visible bubbles surfacing. Hopefully this beer will have a full flavour, because despite the brilliant colour the overall pour isn't great. On the nose this beer seems very promising, it's full of fruity flavours and spicy esters. There are some lovely burnt toffee malts and a hint of raisins on the iniitial waft. This is followed by a lovely banana and clove aroma, very similar to what many Weizen beers smell like. It's very nice and has a smell of sweet bread to finish. There is a touch of alcohol on the nose but this is most likely to appeal to the Eastern European market, but it doesn't ruin the beer like some high end alcohol beers. Karpackie is certainly drawing me in, let's get down to the drinking! The first thing I taste in this beer is a caramel like taste, however it is not too sweet. The banana and clove elements are both much stronger than they appeared on the nose and are very similar to a Weizen beer, just with a much thinner texture. This beer calls itself a lager however I'm struggling to taste the hops, I feel more powerful or bitter hops could have improved this beer. The beer is extremely light and has low carbonation for a beer with such high alcohol concentrations. Overall it's not a bad beer, however I will say it would be incredibly lethal as you just can't taste the alcohol at all! 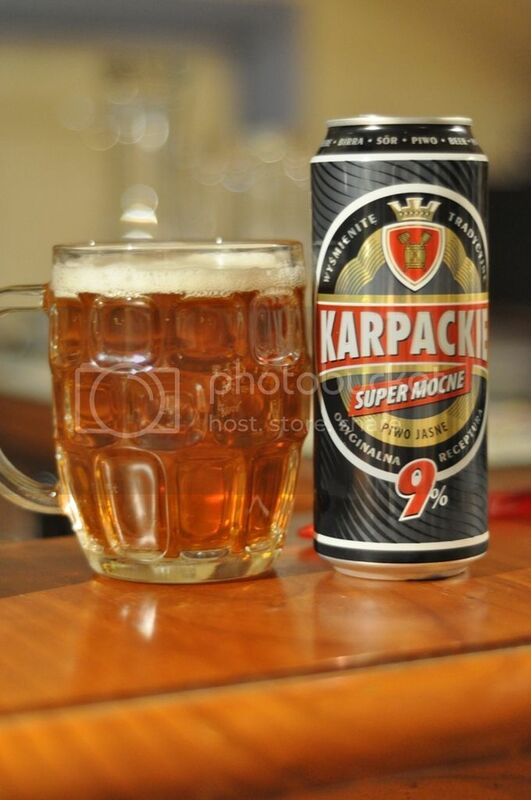 Karpackie Super Mocne is a good example of a Euro Strong Lager. This beer does everything you would want it to, it warms you up and tastes really good. I do think the alcohol content could prove problematic if it were your want to drink many of these as at 9% it's quite high and really you can't taste it at all. This would be a great beer with dinner in winter or even as an after dinner beer, if you find it I would give it a go, it should not offend anyone and should appeal to most. How many calories in 500 ml can?